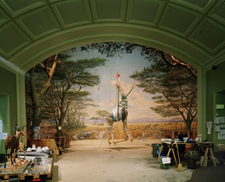 Acclaimed photographer Richard Barnes has photographed behind-the-scenes views in natural history museums around the world. 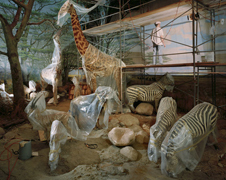 His images reveal an eerie world of half-painted dioramas, plastic-wrapped or crated taxidermy animals — some exotic, others more common — and the odd relationship of humans building or cleaning faux habitats. 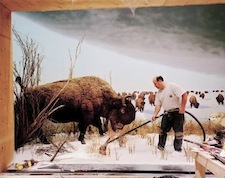 In addition to offering interesting notions about how unnatural natural history museums are, Barnes also explores how we collect, preserve and contain specimens of the natural world. Animal Logic presents a selections of images from Barnes’ larger monograph by the same title. Other projects have included Still Rooms & Excavations, which examined the role of museums in society; Unabomber, a photo documentation of Ted Kaczynski’s cabin; Phylum and Refuge, a consideration of the hybrid architecture of bird nests constructed from detritus. He has exhibited and lectured extensively and is a recipient of the Rome Prize from the American Academy in Rome. He lives in New York.